Thats all good,I dont know anything becuase im from Australia..**** i have a kangaroo as a pet that i ride to work in. This is as easy as i can put it to u,go get your coating as the ppl who are doing it for u if u also wrap there product and it flacks off,will they stand by it and give u back your $$ or redo ot for u. This how i do headers for ppl,but with out ceramic coating,BUT i do not use hose clamps as they pull apart with heat and become loose.Go buy your self some stainless safty wire and wire tie it up..it will look alittle like this. But hay u dont have to lissen to what have to say as ive never done it b4. sounds like they gave you the wrong coating. Jethot went through a change of hands a few years back and was bending over backwards for peolpe to get busness back. The sterling (chrome look) you mentioned earlier is only good to 1200 so Im not suprised it came off. Mine are coated by me on the headers and grimmspeed on the up. Im very happy with it so far. Ive had wrap on my gruppe-s headers and it worked good, I just had to redo it every year. I had to go back to oem manifold after a oil pan swap for clearance. I notice a increase in spool with the coated manifold though. For people with problems with coatings flaking off, you just got the wrong coating. I got my downpipe coated from Crucial Racing. They use their own coating, not Jet Hot, not Swain. The owner of Crucial says he has seen both coatings fail when used in turbo applications, which is much hotter than N/A which Jet Hot was designed for. Believe me I had the same questions when I called them about their coating. I was skeptical about the coating lasting and I was worried about it coming off. However, he showed me the process they used and how he warranties against it flaking off. I got my entire downpipe coated for about $120 including shipping, and its been over a year and a half now. I drive my car the way it was meant to be driven, which includes its fair share of beach sand driving, over 10000 miles of trips from NJ to Florida, and also its fair share of NJ road salt. To this day the coating on the underside of the downpipe that faces the road is still solid and shows no sign of fading or flaking off. Isn't that SS safety wire just normal lockwire? Anyways, I'm done wrapping my header and want to know if it's okay to spray outside in -15c temps? I'd rather not spray inside the house in the basement due to the vapours...even though I have a full respirator. huhhhhh well -15c is colddddddd i doubt you want to paint in that temp cuz i don't think it will dry properly but im not sure exactly what that means as i have never tried that. I just want to spray it outside and after each coat i'll bring it inside. I just don't want the toxic vapours floating around. 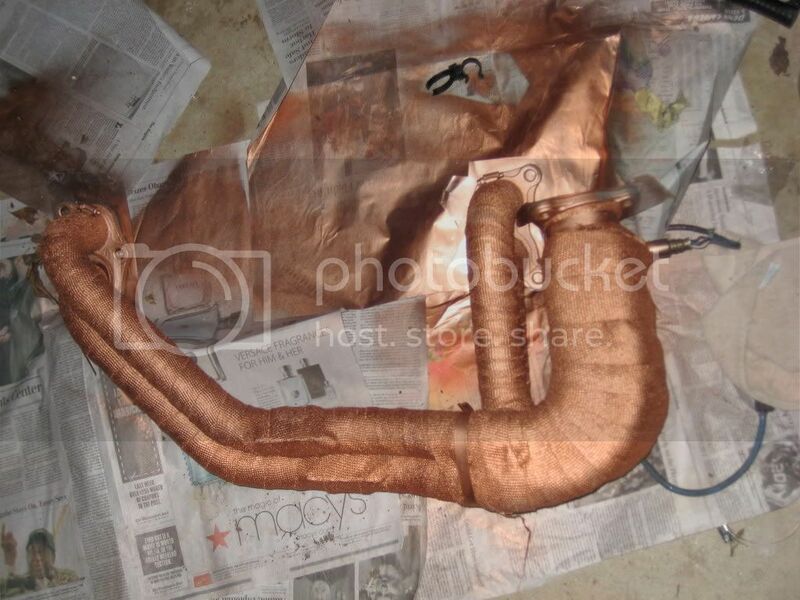 I wrapped my header and sprayed it with copper (just like the pic above) and it caught on fire the first time I drove it. I had just pulled into my driveway after a test drive and it ignited while I was walking away from the car. Thank God I had a hose right there. That wrap is actually made of fiberglass with a chemical on it that hinders burning. Fiberglass can't deal with pre-turbo temperatures very well. If you search ebay you can occasionally find ceramic cloth; this stuff is infinately better than fiberglass. My current header is coated inside and out with Jethot stuff. The Crucial uppipe is coated with a Techline coating (the step up from Black Satin). Both look brand new years later. For a poor man's job buy yourself some Black Satin and either spray it with a disposable or brush it on. It won't stay on like a pro job, but it does work well. I coated the inside and outside of my exhaust and it made a difference. A coated header is a night and day difference. My DP is coated with Black Satin and wrapped with the thermatec garbage. It stunk for a month, but you can touch it. Actually the heatwrap + the coating is good for 2000F. I was just about to wrap my coated header and now I am not so sure. THe fire thing kinda scares me. 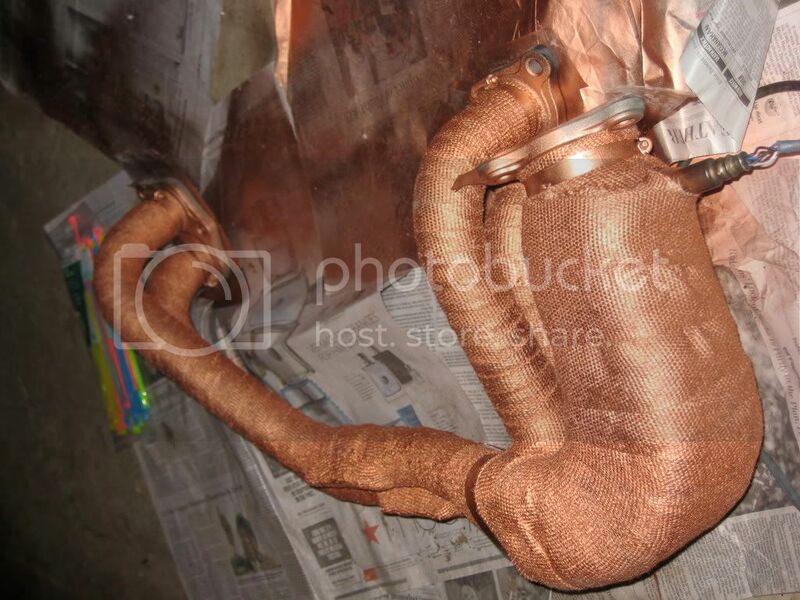 What is the difference with the copper spray vs. using like the 2000* exhaust spray paint? Last edited by gtasti; 03-05-2009 at 04:09 PM. "However, some turbo applications see exhaust temps over the 1,700ºF limit of EXTREME STERLING, so the JET-HOT 2000 will work better for those types of vehicles. This coating has a semi-rough texture." "Nobody can get a coating to permanently bond all the way through an exhaust tube unless it is very short and open from both sides. We do not coat the inside of turbo parts so be sure to let us know if you are sending turbo parts so we can mask them properly. Naturally aspirated pipes may be coated on the inside if it looks like the coating will not interfere with the mounting of the pipe to the head or the mating part. If you have any specific masking requirements, be certain to let us know where you want the part to be masked so we know what you are looking for." Did you let it dry before you ran it coated in flammable aerosol? Also, what brand wrap? How would water get trapped if you ceramic coat it, wrap it, and then use the high temp silicone spray on top of the wrap to seal it so water and dirt won't get in there? i wonder heat retention of silicone compared to copper. 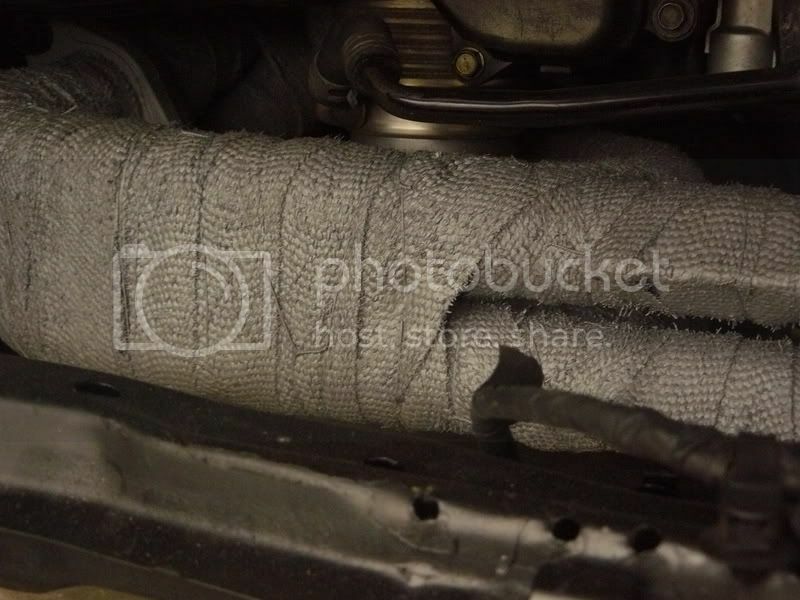 lol im sure it works wonders as a sound deadening material. what silicone are you thinking about?? It says "To finish off a clean and well-protected Exhaust Insulating Wrap application it is recommended to use the Hi-Heat Coating. The coating will protect the wrap from abrasion and harmful liquid spills. Extra resins and binders toughen the surface, extend the life of wrap by protecting it from friction, and seal the pores to minimize the penetration of harmful liquids. The coating also works excellent as a paint directy on metal surfaces"
I got VHT Flameproof for ceramic coating, then some white wrap (I wanted copper I know it's better just more $) and then some black silicone spray stuff... I hope it deadens sound like you say haha but I guess I just got it more as like a protectant from water and stuff? 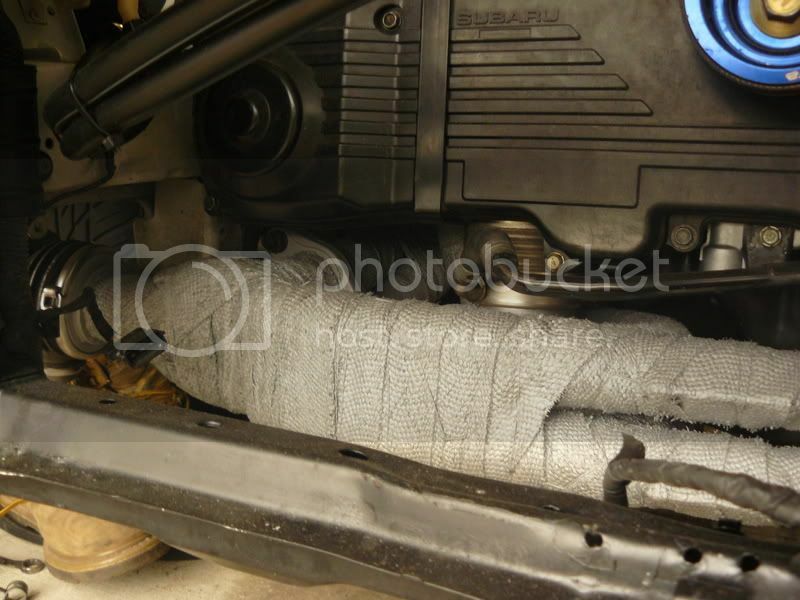 hey i got a hks down pipe from my friend when i bought my sti but i see its all heat wrapped and everything. and if its "tuned" does that mean its nicely and effectivly wrapped with heat wrap or does that just mean i can put the hks one on and just wrap it up? sorry iam car retarded lol. I don't think thats silicone man, thats copper spray. i don't know what the black is, so it may be silicone but ive never heard it referred to as silicone. Thats the same copper coating i used. Its nice i guess, all the coatings i see seem to come off but that doesn't mean im going to suggest not using them. i suggest getting two cans and really caking it on like crazy. i don't really understand by what you mean your down pipe is tuned??? I am a little confused... you have a downpipe that is already wrapped? A pipe cannot be "tuned" - I have no idea what that means? Maybe they meant that the [i]car[i] is tuned for the downpipe already. That means the ECU is remapped/reflashed/programmed to handle a downpipe. Now, if you're talking about wrapping your HKS pipe, yes you can do it if it's not wrapped already? man, that VHT Flameproof was JUNK! I mean, I'm sure it's user error... but still... sat there and sprayed an ENTIRE CAN on my uppipe and none of it stuck at all. I even cleaned up the BRAND NEW Uppide, then scuffed it up a little bit with some sandpaper, and that VHT ran like pure water! Guess I should have used the primer, eh? I hope that's all it needs. I can't get to a friggin sandblaster.... but the Downpipe worked just fine, didn't even need to scuff that up or use primer. VHT stuck like glue to it. Different metals maybe?